Summary: We describe a novel technique to selectively catheterize the meningohypophyseal trunk (MHT) and its branches. We emphasize the difficulty in accessing the MHT via an ipsilateral approach because of the geometric orientation of this vessel to the parent internal carotid artery. A variety of lesions can derive blood supply from branches of the meningohypophyseal trunk (MHT) (1–3). Endovascular embolization of these branches may be curative or a significant adjunct to definitive treatment (1, 2). 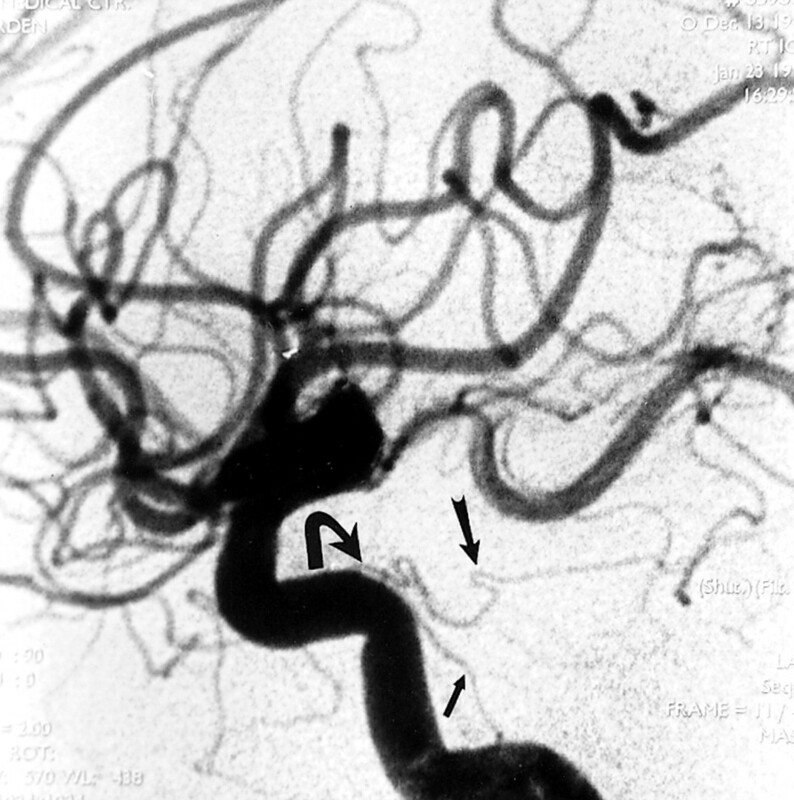 Despite advancements in microcatheterization and microguidewire technology, selective catheterization of the MHT and its branches is often difficult or impossible owing to the small size of the arterial supply and the geometric orientation of these branches relative to the internal carotid artery (ICA) (1) (Fig 1). We report a patient in whom an iatrogenic dural carotid-cavernous fistula developed with arterial supply from a branch of the MHT and describe a new technique for selectively catheterizing a branch of the MHT. A 33-year-old right-handed woman presented with a recurrent pituitary macroadenoma approximately 20 months after her initial surgery. The most recent preoperative MR study showed a macroadenoma measuring approximately 4 cm in its largest transverse diameter invading both cavernous sinuses (Fig 2A). The patient underwent a second transphenoidal approach with a subtotal resection of the adenoma. Two hours after the surgery, the patient experienced brisk epistaxis of bright red blood. The bleeding was initially controlled by packing the nasal cavity. 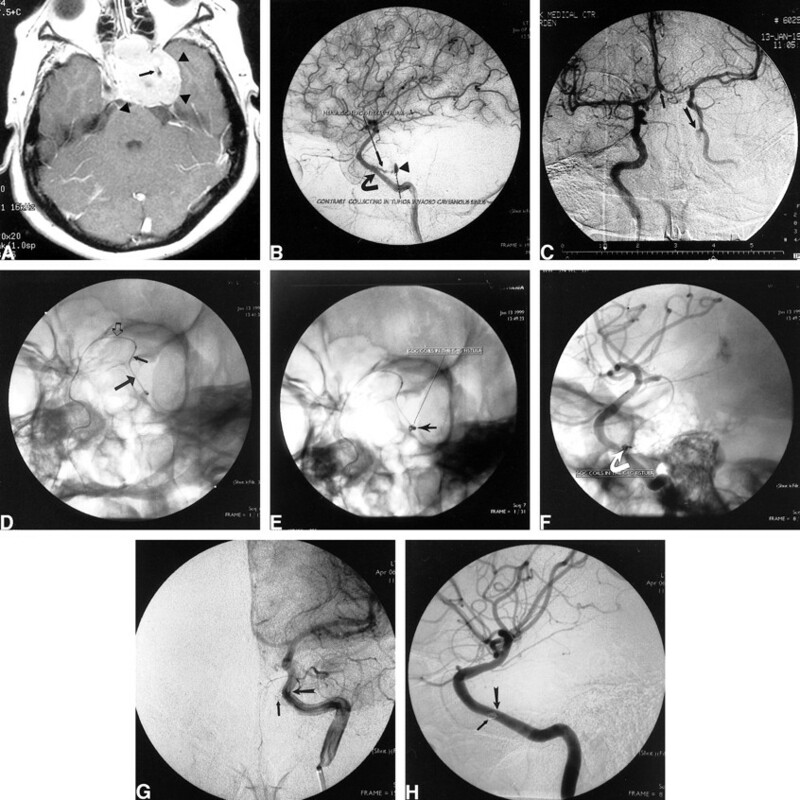 An emergency ICA angiogram obtained with digital subtraction angiography (DSA) revealed a slowly filling left carotid-cavernous fistula associated with an avulsed branch of the MHT bleeding into the cavernous sinus (Fig 2B). Transarterial embolization using a microcatheter and microguidewire from the left ICA was aborted after multiple unsuccessful attempts were made to selectively catheterize the MHT. Because the fistula was filling slowly, carotid cross compression therapy was instituted (4). This therapy required that the patient, with her right hand, compress the left carotid artery daily, gradually increasing the length of compression time. The patient was observed in the hospital, and 10 days later, a follow-up angiogram revealed patency of the fistula despite resolution of the epistaxis. An alternative, contralateral, approach for superselective catheterization of the MHT was attempted. The angiogram revealed a patent anterior communicating artery (ACoM) with brisk cross filling (Fig 2C). A guiding catheter was placed into the high cervical right ICA. A microcatheter and a microguidewire were placed coaxially through the guiding catheter and navigated under roadmap into the A1 segment of the right anterior cerebral artery. A diagnostic catheter was then placed into the cervical segment of the left ICA. Roadmapping through the left ICA was performed. The microcatheter was then navigated from right to left through the patent ACoM, down the left supraclinoid ICA to the horizontal (C4) intracavernous segment of the ICA (Fig 2D). The microcatheter/microguidewire combination was then passed from anterior to posterior through the horizontal intracavernous left ICA and then through the MHT into the fistula without difficulty. Two 2-mm × 2-cm Guglielmi detachable coils (GDC-10 soft coils) (Target Therapeutics, Fremont, CA) were then deployed into the cavernous sinus (Fig 2E and F). Postembolization angiography revealed marked slowing of the shunting. Because of the significant reduction in flow, the procedure was terminated and cross compression of the left ICA was continued. A 3-month follow-up angiography revealed complete obliteration of the arteriovenous fistula (Fig 2G and H). Our case illustrates an important and novel technique, which has not previously been described, that can transform an unsuccessful endovascular catheterization of the MHT into a relatively easy, fast, and successful procedure. Careful analysis of the difficult geometry in this region suggested an easier endovascular route. As illustrated in Figures 1 and 2B, the MHT arises from the ICA at the junction of the C4 and C5 segments (5–7). It projects posteriorly, nearly parallel to the horizontal ICA (C4 segment) and is easier to access in a retrograde fashion from anterior to posterior. In a contralateral, retrograde approach, the catheter does not need to make an acute turn to enter the orifice of the MHT. This is in contrast to an ipsilateral approach, which may result in failure to catheterize the MHT. Many vascular lesions of the skull base derive blood supply from the MHT. Endovascular procedures are often difficult or impossible if attempted from an ipsilateral approach. In the technique described here, we used the contralateral ICA with retrograde catheterization of the carotid siphon. This provided better access to this difficult anatomy because of the more favorable anatomic geometry. This technique may be especially helpful when a transvenous route cannot be used.